AAF HQ., HASTINGS MILL - We are leaving here for the States tomorrow. Before we go we want the G.I. 's left behind to know how we WACs really felt about our life here. I think I speak for most of the WACs at Hastings when I challenge the statements made several weeks ago by three WACs in New York returning from this base. Either they were trying to get their names in the paper at any cost, or they were unsuccessfully trying to be funny, when they said "life here was rough." Like any other G.I. 's we didn't like being in the Army, nor did we enjoy being 13,000 miles away from home. 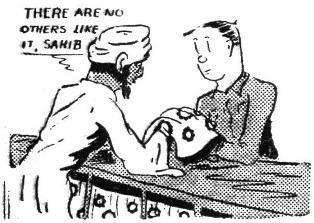 But we do have enough sense to appreciate the "good deal" we had in comparison with the way G.I. 's had to live up in Assam or over in Burma. It is true that Hastings is a converted jute mill. But our Army moved heaven and earth to make this place comfortable for the WACs BEFORE we got here. While G.I. 's in other parts of the Theater were sleeping in pup tents and fox holes, we were in beds in a dry, brick cement building. Right on this base, male G.I. 's lived in hot tents, while our barracks has fans. We even had bathtubs installed in our barracks, and toward the end, hot running water. The food? Well, the Army never promised us breakfast in bed, and we didn't get it. G.I. chow is G.I. chow. But a lot of our husbands and sweethearts were eating cold K rations while we sat down to fresh meat, even if it might have been water buffalo. It seems odd that the three WACs who made the American newspapers forgot so soon about the hamburgers, eggs, cookies and iced drinks at the Snort Club; about comfortable chairs at the Red Cross; about the movies three times a week. If there was ever a WAC at Hastings who didn't get to Calcutta, it was because she was too lazy to catch the bus that went in every hour. And, of course, there were thousands of G.I. 's who were more than delighted to take WACs places. As far as social life was concerned, I am sure we were a lot better off than many Stateside gals who lived thru the darkest days of the male shortage. So, "au revoir" to I-B Theater. Thanks to all the G.I. 's who were so swell. Now that we're going home, we can appreciate the fact that it was fun. And please - brother G.I. 's - don't get us wrong. We appreciate the "good deal" we had in comparison with that suffered by most of you. 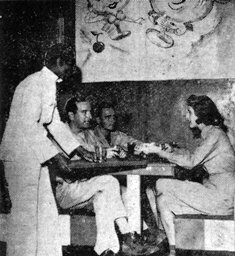 One night in October life slipped away forever from an American boy lying in a bamboo and concrete basha ward at the 20th General Hospital in Ledo. As she stood above his bed, Lt. Jo Holod, now of the 142nd Hospital in Calcutta, was struck by the tragedy she, as the boy's night nurse, had witnessed. A short time later she wrote the following tribute to that nameless youngster. That still occupy the minds of those who card for him. When did his soul depart, where to, and why? Who caused his untimely death - the typhus mite or gluttonous man? And the night is empty and still. I-B Ships Go To Seattle By SGT. JACK DEVLIN Roundup Assistant Editor Troop movements by water out of the Port of Karachi will be discontinued Jan. 20, it was disclosed today by Theater Headquarters which also announced the January quota of men being shipped home will total 22,848. A Theater spokesman reported at the same time that under a new policy, all troops sailing on transports for the States will travel by way of the Pacific to Seattle, Wash., starting Dec. 23 at Calcutta and Jan. 7 at Karachi. redeployment of personnel in the China Theater and Western Pacific islands. Meanwhile, Theater Headquarters said a total of 171,579 troops will have been shipped home out of Karachi and Calcutta between V-J Day and Jan. 31, Of this number, 43,000 are China Theater personnel. As a result of the shipments, the Theater strength by Jan. 31 will have been reduced to 33,700 men. The shipping quota for February has not been announced. The Port of Karachi was activated Sept. 1 and the first vessel departing with troops was the General McRae, which sailed Sept. 23. The General McRae will also be the last ship to leave Karachi when she sails Jan. 20. Some --- activities will continue at Karachi, it was said. Meanwhile, the last ship sailing from Calcutta by way of the Atlantic will be the Gen. Squier, scheduled to leave Dec. 13. The next ship out of Calcutta will be the Gen. Patrick, sailing Dec.23 and running through the Malacca Straits, around Singapore, and out to the Pacific. Trips from Calcutta to Seattle take 22 days. The last ship from Karachi to travel by way of the Mediterranean and the Atlantic will be the converted luxury liner, Santa Rosa, which makes her departure Jan. 1. She will be followed by the Gen. Greeley, which will sail Jan. 7 for Seattle. The Karachi-Seattle run takes 28 days. The first ship from the Theater to return to the states by way of the Pacific was the S.S. Marine Robin, which departed Nov. 5. She was followed by the , the Marine Angel and the Marine Devil, which sailed respectively on Nov. 12, 17 and 23. These are the first ships in this Theater to be transferred here from the European Theater. At the end of their present trips they will proceed to Shanghai for Chinese Theater troops. Just how long the ships will continue to run to Seattle had not been decided but it was believed the policy would remain in effect at least until February when most of the troops eligible for separation will have gone home. Meanwhile, Stateside reports from United Press and Army News Service showed that at present railroad transportation loads have reached such a peak that demands are being made for a drastic curtailment in civilian travel across the continent. Thanks to demobilization, the Army Postal boys have got to re-address and forward about 105,000 Christmas packages - a fourth of all the Yuletide boxes coming into the India-Burma Theater this year. Most of the Christmas packages that have to be re-addressed were sent by the families and relatives of men who didn't know soon enough when they were going to leave the Theater. But the packages will catch up with them, if a forwarding address was left. And 80 percent of the men do leave them. If you were one of those people who didn't get your packages last year until February, you at least probably won't have any worries on that score this year. Col. A. E. Adamson, Theater Postal Officer, said that all of the 430,000 pieces of mail now known to be en route to this theater will be delivered by Christmas Day. He said 43,000 sacks of Christmas mail, with each sack holding an average of 10 packages, were dispatched from the States after being mailed between Set. 15 and Oct. 15, after which no Christmas mail was accepted for overseas. Last year, he said, there were 210,000 sacks containing an estimated 2,100,000 Christmas packages. They were mailed within the prescribed time, he said, but wartime transportation bottlenecks in the States wrecked schedules here. All Category IV mail is screened in New York, he said, and is re-addressed on arrival here by Central Postal Directory. Here, Roundup WAC writer, Sgt. 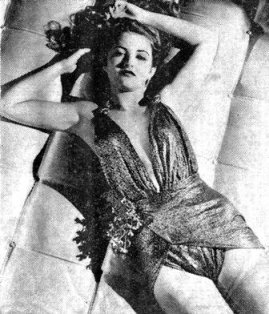 Dorajean Ellis, spends an evening at the Snort Club. When this was taken T/Sgt. Morris Glazier and Pfc. Eugene Stumbers were doing the "oohing" and the "aawing." 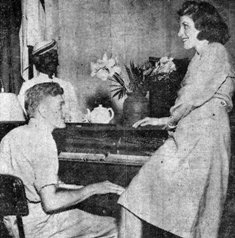 In the center, one tries out the piano at the Swelter Shelter, the Red Cross Club at Hastings Mill and attempts to persuade Dorajean to sing. And at right, it is "salaam and farewell" to the ayah. Cpl. Waneda McLemore helps Dorajean say goodbye to Hastings Mill. Things don't look so rough, do they? We, the departed members of the Roundup staff, say farewell and thanks to you officers and men of the Theater. Whatever the Roundup was, you made it possible. We wish good luck to the new staff and know it will receive your full cooperation. To one man, especially our vote for a Pulitzer journalism award for his fighting belief in freedom of the press and his hatred of intolerance. He founded the Roundup as the first Army newspaper overseas. His only instructions were: "If you can prove it, print it." Gen. Joseph W. Stilwell never budged an inch from that stand. MALIR - There was a time when this gullible writer labored under the impression that we were all in the same Army. But that was before we arrived at this Replacement Depot. After two weeks of walking these long, winding, dusty streets, trying vainly to hitch a ride with the many passing vehicles, I've come to the conclusion that the United States Army is divided into two separate groups: Them what has vehicles and them what has not. There's been no official count, of course, but the number of vehicle-possessors and non-vehicle-possessors appears to be about even steven. This ratio, however, stands a good chance of being altered in favor of them what has, if present disregard for speed limits and other safety precautions continues in the U.S. camp area. Some of these drivers seem to have no other purpose of the day than trying to kill every damn G.I. caught walking along the road. This, I think, shows a deplorable lack of up-bringing. I was always taught that if I should ever be driving a car, never try to kill anybody with it. "Never try to kill anybody with one of these here auto" was the way my mother always put it. I've followed that sound advice and have made a host of friends as a result. Weary of much walking, a friend of mine - a guy named McDougal or something - resorted to trickery in an attempt to get a ride. Clever fellow, he appealed to the sympathy of the drivers. He borrowed a pair of crutches from the dispensary and hobbled out to the road. This, he thought, must surely do the trick. How wrong he was. That was two days ago. I just met him again this morning, still hobbling around on crutches. "No," he answered to my question. "I didn't catch a ride. But these crutches are much better than walking. You oughta get some yourself. Or better yet, get a wheelchair. It's loads of fun." RETURN OF THE NATIVE Remember Ole Dave, the Red Richardson, who wrote for Yank Magazine in between parachute jumps, tank battles and Kachin engagements in the Burma campaign? He has returned to his old stamping grounds, this time as a civilian correspondent for Time and Life Magazines. Here he gloatingly allows an old side-kick, T/Sgt. John Blay of Yank, to try on one of his six suits for size. Well do we remember Dave's last days as a G.I. out here: "Where the hell's those orders?" Ex-T/Sgt. Dave Richardson, former Yank combat correspondent, is now back in India as a civilian correspondent for Life and Time Magazines. Dave is now known among his old G.I. buddies who still remain out here as "The Man Who Came To Khana and Came Back for More Chapattis." Here he gloatingly gives some civilian impressions. See picture at right. Five months ago I left the dear old India-Burma Theater with 115 points, dysentery and a burning desire to become a civilian again after four years and a half in the Army and 32 months in such choice overseas spots as New Guinea and Burma. I was put into a C-46 after a short two-months wait at Karachi, along with two Section Eights, two downy-faced ATC majors and a Special Service lieutenant colonel with four battle stars (Karnani Estates, Kandy, Kashmir and Delhi). As we took off from Karachi I looked back at India and said to myself, "Brother, this is the last time you'll ever see this place again (or words to that effect)." And I really thought so. Yet here I am, back in India - and just in time for Christmas. As a civilian, too - probably the only G.I. veteran in the whole Theater, if that's any consolation. All I did was get into a plane at LaGuardia Field, New York, last Friday afternoon and on Monday I was here. What a place to wake up after a weekend! No, I hadn't been drinking when I got on that plane and I'm not crazy - I've got my Army discharge to prove it. It says under Medical Record that all I had in the Army was malaria, dysentery, dengue, yellow jaundice, typhus, jungle rot and sand-fly fever. Here's the way it was: When I got out of the Army last August, barely passing my physical examination, I started looking for a job. Meantime I was buying civilian clothes like mad and catching up on good food and full-strength beer. Then one day I counted my money - both bills - and discovered I had been spending too much and didn't have a job. Of course, I could have had my old job back at the New York Herald Tribune under the G.I. Bill of Rights, but it just didn't appeal to me any more. And then a friend comes up to me one day and says, "I know just the job for you," and hands me an address. "The bearer of this card, while outside the Continental United States, is entitled so far as local facilities permit, to the privileges of a lieutenant colonel (yes, lieutenant colonel) with respect to messing, billeting and the use of recreational facilities and post exchanges." From then on, all I did was flash this card upon arriving at an airport or Army post and lieutenants and captains jumped. Isn't civilian life grand! At least it was. When I arrived in New Delhi I discovered my dream was over. I was handed a memorandum addressed to all Accredited War Correspondents, India-Burma Theater. It informed me that as of December 1, 1945, post exchange cards must be turned in. U.S. War Correspondent insignia taken off, there were no more free rides in Army planes and I wasn't a simulated lieutenant colonel anymore. Well, it was fun for a week, anyhow. From now on I'll be smoking Craven A cigarettes instead of Chesterfields, chewing betel nut instead of Wrigley's, drinking tea instead of cokes, riding in a third class railroad car along with my bearer, instead of in a C-47 with a 19-year-old pilot, and wearing civilian clothes instead of my beloved uniform. Of course, there still are a few little pleasures in being a civilian. I don't say this to deter any of you men from joining up in the Regular Army because you know as well as I that it's a splendid opportunity for any full blooded young man to travel, learn a trade, get medical care and refresher courses. gee, I wish I'd joined up again, but that's just my tough luck. One of my chief pleasures in being a civilian is a habit I got into back in the States. I pick out a pompous officer on the street, the kind who carries a swagger stick, walk up to him and say, "Corporal, can you tell me where the Post Office is? or "Hey Mac, ya gotta light?" Come Christmas week, YANK, the Army Weekly, will fold up its pages and go out of business. December's last days will see the end of the Army publication's CBI edition, while YANK's U.S. and foreign offices will put out their last magazine at that time. Started under War Department sponsorship in 1942, YANK was set up as a publication written by enlisted men and for enlisted men. Throughout its publishing career, EMs made the magazine's editorial policies and wrote its stories. YANK's few officers served in business and administrative capacities only. The editorial freedom granted the Army's global weekly was reflected in the "Mail Call" pages in which G.I. 's aired their gripes each week. YANK editors and writers, as well as artists and cartoonists, worked under few restrictions other than those of security and good taste. First published in New York, YANK expanded rapidly and followed the Armed Forces into new areas of war. At the height of its career, the G.I. 's magazine was publishing in such widely separated points as Panama, Australia, Cairo, London, Teheran, Calcutta and several more rear echelon areas. YANK's editors climaxed their operations with a Tokyo edition which was waiting for occupying soldiers as they moved into the Japanese capital. Writers, photographers and artists of the Army publication's staff were at the front in every major theater of war, gathering first-hand combat reports for the G.I. reader. YANK had three men killed in action, plus several more who were awarded the Purple Heart. A lot of gas and oil has flowed through the pipelines of China, Burma and India since those August days in '43 when the chiefs of the British and American nations and their board of strategy put heads together and came up with one of the plans that became part of the blueprint to beat the Japs. Now the story approaches its close. When Petroleum Section of the Services of Supply becomes defunct in the near future, the last chapter in the task of supplying the avid war machine in Asia with its life blood will have been written. When the last drop of gas dribbled through the China pipeline of Oct. 31, last, it became part of a total of 19,830,720 gallons to have gushed through since the preceding April 9. But this was only a grease patch on the more than 400,000,000 other gallons that coursed through the pipes snaking through Bengal, Assam and other parts of Burma. At Quebec, four major projects had been approved - construction of two four-inch pipelines from Tinsukia to Myitkyina via Ledo, a six-incher from Calcutta to Dibrugarh, another six-incher from Calcutta to Kunming through Dibrugarh, Ledo and Myitkyina, and another from Budge Budge at Calcutta to the Twilight airfields. Tinsukia Tank farm was the heart of the system that squeezed out the precious fluid that moved the arms and legs and wings of the CBI war-making body. The tanks at Tinsukia, ventricles of the heart, pumped out nearly 20,000,000 gallons a month through the system. The China pipeline, from Tinsukia to Kunming, was originally intended to run along the Ledo Road via Tengchung and Paoshan, a matter of some 983 miles. Later it was routed through Myitkyina and Bhamo, meeting the Road at that point and continuing on to Kunming. The other four-inch project was to follow the same route with the mission of providing motor fuel for Ledo Road vehicles. Eventually, one pipe stopped at Myitkyina while the other was pushed on to China. On April 9, the first gas flowed into Yunnanyi, six days ahead of schedule. It took two weeks and 2,158,000 gallons to get the line primed for the payoff operation. Figures released on the other three major projects approved at the Quebec conference indicate the tremendous amount of 100 and 80-octane, Diesel oil, and motor spirits the CBI consumed in a Theater remote from its source of supply. Through the pipe from Calcutta to West Bengal heavy bomber airfields went 98,850,000 gallons from 13 March 1944 to 4 Nov. 1945. From Budge Budge, Calcutta to Tinsukia, 10 July '44 to 1 Nov. '45 coursed 232,512,400 gallons and from Chittagong to Tinsukia during the period 17 Jan. '45 to 1 Nov. '45 flowed 69,897,000 gallons. WAR II COSTS LED BY U.S.
WASHINGTON - World War II cost the world one trillion, one hundred and fifty four billion dollars for armament and war materials while property damage amounted to $230,000,000,000, according to a war cost survey. The survey, prepared by researcher Ames H. Brady and American University in Washington, D.C., did not include money spent and large damage of the 10-year war in China. None of these figures were available. Brady placed U.S. expenditures for war material at $317,600,000,000. Russia spent $192,000,000,000 and the United Kingdom $120,000,000,000. The war cost the Axis powers about $468,939,000,000. Germany spending $272,900,000,000, Italy $94,000,000,000 and Japan $56,000,000,000. The priest in the battered Gurkha hat walked down the dusty road from Sumprabum to meet the advancing, armed Japs. "Are you Chinese?" he shouted in a voice shot through with a strange-sounding lilt for that part of the world. "No, Japanese," came back the reply. "What are you? English?" The padre with the bonny brogue then explained to the chagrined Jap officer, who had no way of telling whether the man really belonged to neutral Eire, that he had a group of Burmese refugees under his wing. They were suffering from want of food and shelter, he said, and he must have help. The upshot of his earnest speech was that the officer reached into his pocket and brought out - no, not a weapon, but five rupees for the cause of Burmese charity. The suspicious Japs tried often to trap the padre into giving himself away as an Englishman. Once they even played God Save the King, but Father Stuart sat firmly rooted in his chair and in Irish neutrality. Father Stuart never engaged in actual combat, but partly as a result of his influence with the Kachins, to whom he was a loved and revered figure, a jungle-wide intelligence net in north Burma was made available to the Allied troops fighting there. In October of 1943 he started out alone from Ft. Hertz in Burma and after a 240-mile trek south into enemy-occupied territory, reached a field group of Detachment 101, a special operational unit of the Office of Strategic Services. For the first five months he acted as interpreter, some 100 miles behind the Jap lines, between the Kachins and the Americans. Many times Father Stuart exposed himself not only to enemy fire, but also to the danger of bombing and strafing from Allied planes. In March 1944 he attempted to take 200 refugees to a camp near Maingkwan, but failed after the band was ambushed twice with the loss of three natives. When "B" battalion of Merrill's Marauders was surrounded and cut off at Nhpum in April of '44, Father Stuart volunteered to go with about 150 Kachins from Det. 101 and act as a rear guard during the attack which finally freed the battalion. Until May of 1945, Father Stuart carried on with his voluntary task of helping the Allies to clear the hated Jap out of Burma - the Jap whom he had seen torture and kill his parishioners at Myitkyina. Despite ill health and the rough living conditions and health-sapping climate, the Irish missionary priest continued serene and calm through all his non-sacerdotal activities. Only once, according to the story, did he lose his temper. That was when a Chinese servant alledgedly stole his false teeth. "Oh Lord," he prayed, "I know thou sayest people must not take human life, but please, God, can't you reclassify this Chinese?" Working in the same capacity as Father Stuart, was another priest, Father MacAlindon, a less colorful, but none the less valuable adjunct to Det. 101's forces. Father Mac's outstanding contribution to Allied success in Burma was his help in devising tactics which diverted a full battalion of Jap troops from the defense of Myitkyina in the spring of '44. When last heard of Father Mac was back among his flock in the hill tracts. Both were awarded the Legion of Merit for "eceptionally meritorious service" by the Allies when the had rejoined in helping overthrow the forces of evil. After appearing in the South Pacific from Hollandia to Manila, the above USO Unit 506, the Melody Parade, continued on to the China and India-Burma Theaters until illness broke up the sextette. 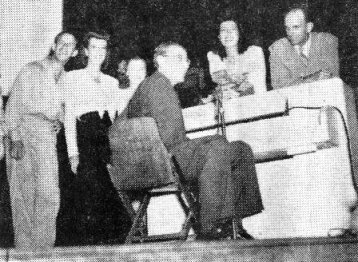 Left to right are Ed Dunning, Jane Whyte, Eve Harvey, Helen LeClaire, Hal Weaver, with Jimmy Sykes seated at the piano. After singing for G.I. 's from New Guinea to Kunming, one of the hardest working, longest traveling USO units scheduled to appear in the South Pacific, China and I-B Theaters won't be able to sing for India-Burma wallahs. Their vocal chords are simply worn out. The luck that held them together singing over 25 songs daily with an average of two shows each day over half way around the globe has run out. One of the featured singers is seriously ill with tuberculosis and another is suffering a serious throat ailment, forcing the unit to disband after nearly eight straight months of steady performances. When their sixth consecutive month of singing in the Pacific was concluded in Manila last Sept. 26, Special Service requested their services in China and I-B Theaters. 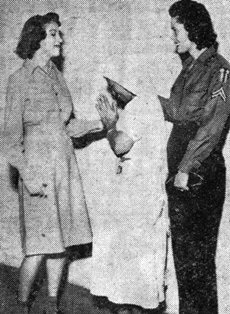 Although most of the USO performers were heading Stateside for lucrative parts after V-J Day, this unit agreed to continue their tour to include the Orient. The Melody Parade unit is composed of classical and semi-classical singers with Jimmy Sykes providing piano accompaniment along with novelty bits. There is no featured "star" of this show as everyone sings in the sextette chorus with each offering individual renditions of classical favorites, such as parts from Carmen, the Bell Song, Ave Maria and Ol' Man River. In the sextette are Jane Whyte, formerly of the New Opera Company; Eve Harvey of the Chicago Civic Opera; Harold Weaver of the renowned Schola Cantorium, specializing in Latin-American songs; Helen LeClaire of the New York City Center Opera Company; Edwin Dunning, popular baritone from the West Coast, and Jimmy Sykes, who, in addition to background and numbers like Military Polonaise and bach's Jesu, Joy of Man's Desiring, adds fun to the serious singing with informal renditions suc as One Meat Ball. The sextette will never forget V-J Day. They were singing in a Luzon hospital ward filled with shell-shocked patients and Helen LeClaire had just concluded Ave Maria. The ward was quiet when suddenly a soldier rushed out and announced that the Japs had quit. The gravity of the event, already heightened by the classical song, struck everyone. While some wept or sat silent, others cheered as the entire ward broke into singing the Star Spangled Banner. The next scheduled number of the show was their version of The Mikado, a take-off on the Jap Emperor which aroused the mentally-ill to laughter and gayety. The unit felt proud of themselves especially after that performance. There was never a dull moment in China, Sykes states. His group was the first to entertain the Marines in North China. Shanghai troops also enjoyed their first "live" entertainment by this unit as did Lanchow and Nanning. The unit hit Kunming just in time for the local revolt and stray bullets gave them many sleepless nights. But their luck ran out when they arrived in Calcutta and lost two of their group to illness. They had covered half the globe, Hollandia, New Guinea, the Admiralties Islands, Milne Bay, Biak Islands, and every island in the Philippines having American G.I.'s. So USO Unit 506 is now heading Stateside to the East Coast. They hope to give impromtu shows in Cairo and Casablanca if they can. Of all the USO groups I've seen, the Melody Parade-ers are genuine troupers, which is the best compliment anyone can give them. Our Indian friends and colleagues of Associated Press of India this week interpreted to their public what constitutes autograph hunting in the United States. "It is reported," wrote a Bombay newspaperman, "that when Hollywood stars were scheduled to sell vegetables in a garden for the benefit of the Red Cross, the garden was reduced to a pulp by the feet of the autograph hounds before the sale started. A policeman who tried to rescue a films star had to be carried to the hospital in an ambulance van." Continuing his disclosure of these Stateside doings - Roundup wasn't able to determine whether the newspaperman had seen these goings-on in person - the writer said that "some film stars do not mind keeping dozens of young boys and girls waiting for hours for their autographs, because keeping them waiting is a good publicity stunt. LEDO, ASSAM - Ever so gently pushed, prodded and pulled by a powerful brace of 11-ton Corbett trucks, and with an occasional nudge from a big diesel "cat" - for all the world like a puffing tug importantly berthing the Queen Mary - a locomotive came back over dangerous Pangsau Pass recently. One of two 30-ton diesel-electric switch engines trucked up Burma late last year, "old 97" crossed the Pass without incident - almost, but her whistle wasn't screaming nor were her driving rods flashing. She waddled over - on a 20-ton trailer and she seemed embarrassed. A locomotive on a motor road is even more out of her element than the proverbial fish out of water. On rails a sleek, smooth-running piece of machinery - off them she's a baulky, cantankerous old goat, to be handled like a crate of eggs. We know - we "asked the man who drove one," Lt. "Casey Jones" Stone of the 330th Engineers, officer in charge of the job. 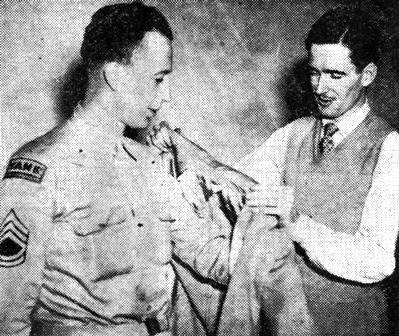 Lt. Stone and his crew, T/5's Byrd, Reber, Greer, DeFonsey and T/4 Lester Piro, sweated the heavy piece of equipment all of the way from Myitkyina, Burma, to the Engineer Supply Depot at Lekhapani, Assam. Leaving Myitkyina of Friday, Nov. 23, the convoy arrived at Lekhapani later Tuesday afternoon Nov. 27, covering approximately 260 miles in five days of boiling the dust for an average speed of slightly better than 50 miles a day. Climax of the long trek came at the Pass, where on a particularly steep curving decent, with straight walls on one side and a sheer drop on the other, the big trailer with its massive load began to "jack-knife." Byrd, at the wheel of the towing truck, gave it the gas and the "jack-knife" was straightened out almost before it got started. Evidence of the great weight of the load was seen when a doubled loop of 1-inch steel cable, connecting the trailer with the "braking" truck behind it, parted like string under the sudden strain of the rapid acceleration. Byrd in the lead truck was able to slow and finally stop the load and with trucks and trailer once more under control, the convoy crawled on, heavy logging chains replacing the frayed cables. Safe arrival in India of the locomotive marked the accomplishment of another step in the task of removing heavy engineering equipment from Burma, a task now rapidly nearing its completion. The moral of this story is that not even a father should give fashion advice to his daughters. A few months back, Les Wagner, stationed in India with the United States Information Service, sent his 13-year-old daughter, Georgia, a Kashmir peasant skirt, assuring her she wouldn't find the like among the girls in Pasadena, Calif.
A few months back, Sheldon Mills, State Department wallah also India-provisioned, also sent his 13-year-old daughter, Mary, a Kashmir peasant skirt, assuring her she wouldn't find the like among the girls of Pasadena. Both attend the same school. Both wore their "exclusive" skirts to school the same day. Both wrote their fathers. Both fathers are now writing their daughters. Ah, India. NEW YORK - (UP) - A group of Flying Tigers who risked their lives daily knocking down Zeros and other Jap planes from cockpits of P-40's are now flying cut flowers, household goods, machinery and what-have-you across the country - at profit. And their rates, according to Max B. Cook, Scripps-Howard aviation editor who writes about tem, are said to be the lowest yet. Three of the pilots, who have converted successfully to peacetime air cargo jobs, made some 300 trips across the notoriously dangerous Hump of the Himalayas after leaving the Flying Tigers. Now they're piloting four and five ton loads over peaks of the Rockies and finding it "just child's play," according to Joe Rosbert, Hump veteran. Rosbert, with one engine out, once cracked up on a 15,000-foot peak of the Himalayas and called it a good landing because he could walk out. He knew the native language and "practically talked his way out of the mountains and jungles." To him, the Rockies are just "a nice bunch of smooth hills." The National Skyway Freight Corp. (Flying Tiger Line) operates from Long Beach Airport near Los Angeles and flies Budd two-engined Conestoga transports originally built for the Navy. Members of the line said roses and chrysanthemums are being flown to Chicago and Dallas regularly and sold at cheaper rates than if they had been grown in mid-west greenhouses.Styles are perishable so load after load of the latest women's wear are being flown from New York to Los Angeles. Billy Eckstein's colored orchestra was flown from St. Louis to Detroit recently to make an engagement on time. Ten Flying Tigers are interested financially in the company. A few are now flying with the Air Transport Command but expect to be back with the Flying Tigers Line when new-type planes are available. The present rate is 16 cents per ton mile from New York to Los Angeles. Each airplane carries a pilot, co-pilot and a flight engineer who acts as maintenance man and knows how to fly the plane. Yes, the Flying Tigers are doing all right. The Roundup is a weekly newspaper of the United States Forces, published by and for the men in Burma and India, from news and pictures supplied by staff members, soldier correspondents, Army News Service and United Press. The Roundup is published Thursday of each week and is printed by The Statesman in New Delhi and Calcutta, India. Editorial matter should be sent directly to T/Sgt. Arthur Heenan, Hq., U.S.F., I.B.T., APO 885, New York, N.Y., and should arrive not later than Saturday in order to be included in that week's issue. Pictures must arrive by Friday and must be negatives or enlargements. Stories should contain full name and organization of sender. Complaints about circulation should be sent directly to Capt. Drexel Nixon, Base Section APO 465, New York, N.Y. Units on the mailing list should make notification of any major change in personnel strength or any change of APO.